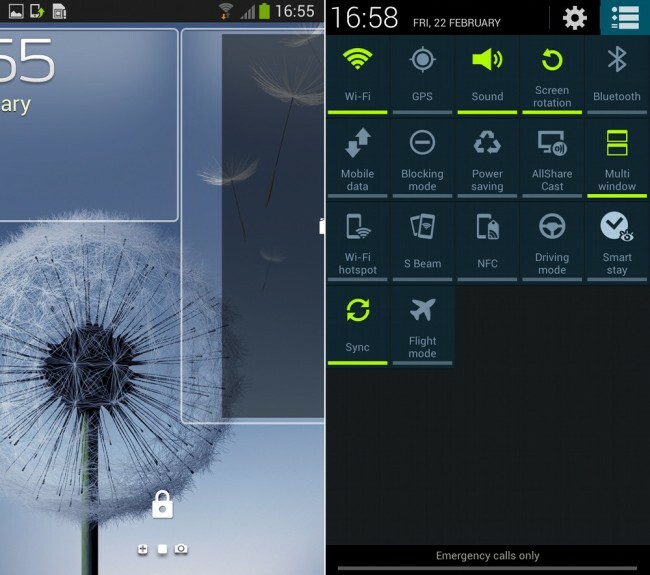 The first TouchWiz version of Android 4.2 has leaked today over at SamMobile for the Galaxy S3, giving us a look at how Samsung plans to incorporate the new features that came in the newest version of Jelly Bean. At first glance, it’s most definitely still TouchWiz as you know, but Samsung did manage to sneak in all of the goodies you’ve come to know. The first thing we noticed was lock screen widgets, which take on a similar UI to stock Android. A swipe from the right gets you directly into the camera – a swipe from the left gets you into the rest of your widgets. In the notification area, we see the second page of toggles, though Samsung has skinned it and also added mode options than Google ever imagined when it created this page. There are also supposed to be new voice controls for completing actions on your phone, Daydream, more actionable notifications, a better ripple effect, and more.